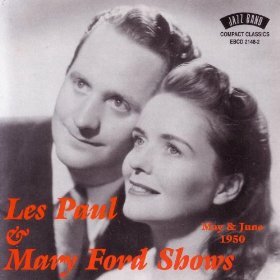 Les Paul had hosted a 15-minute radio program, The Les Paul Show, on NBC in 1950, featuring his trio (himself, Ford, and rhythm player Eddie Stapleton) and his electronics, recorded from their home and with gentle humour between Paul and Ford bridging musical selections, some of which had already been successful on records, some of which anticipated the couple’s recordings, and many of which presented dazzling re-interpretations of such jazz and pop selections as “In the Mood,” “Little Rock Getaway,” “Brazil,” and “Tiger Rag.” Several recordings of these shows survive among old-time radio collectors today. The show also appeared on television a few years later with the same format, but excluding the trio and retitled The Les Paul & Mary Ford Show (aka Les Paul & Mary Ford At Home) with “Vaya Con Dios” as a theme song. Sponsored by Warner Lambert’s Listerine, it was widely syndicated during 1954-55 and was only five minutes (one or two songs) long on film and therefore used as a brief interlude or fill-in on programming schedules. Since Les created the entire show himself, including audio and video, he maintained the original recordings and was in the process of restoring them to up-to-date quality at the time of his death.